Sign up and receive Property Email Alerts of Houses for sale in Greyton, Caledon. Can you afford NOT TO BUY THIS right now! Fully furnished to perfection. Buy to rent or Move in. No mess no fuss no removal company and no boxes. All done for you with style. You can save time and money if you buy this HOME AS IS, complete with brand new Smegg Gas stove and fridge. 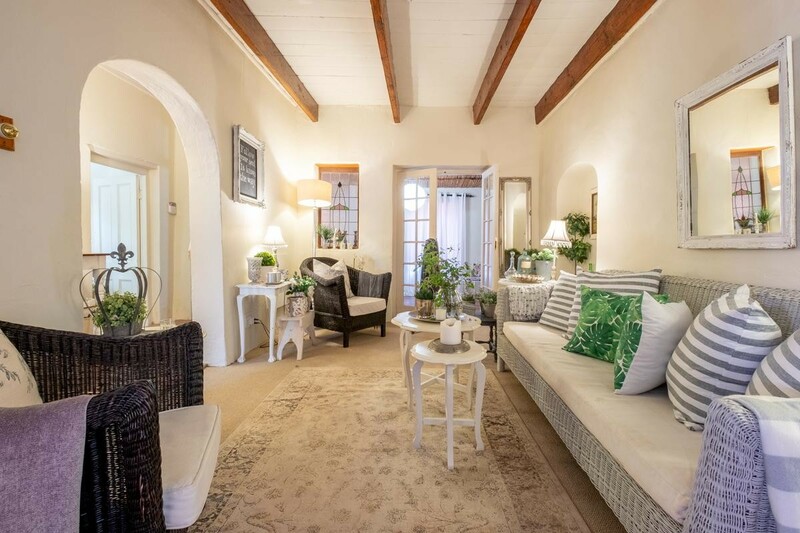 Located in one of Greyton's historic and sought after streets this is a dream home that has been beautifully decorated with love. Four Bedrooms, 2 Bathrooms, Open plan kitchen, dining room, patio, baby lounge, big lounge, sun room, outside patio, double garage and a garden overlooking the mountains. Weekend guests love it. So will you. The cows walk past, the horses gallop by and all you have to do is buy and relax and feel the heartbeat of Greyton. Safe, secure, loads of character, and perfect for entertaining. Will suit a family or just 2 people wanting peace and quiet. The house is perfect for weekend and holiday accommodation. An investor's dream till you can leave the city permanently. Did you know you can save thousands by doing this one thing? Right Now. Sign-up and receive Property Email Alerts of Houses for sale in Greyton, Caledon.